On the Key Biscayne Island Adventure Bike Tour you will ride to beautiful Key Biscayne Island, a natural oasis with perfect bikeways and pristine beaches. Cycle across the Venetian Islands, refresh at Bayside Marketplace, and cruise to Key Biscayne enjoying breathtaking views. Learn about the history, see the sites, take lots of photos, and make new friends. Miami is a biking paradise -- year-round sun, gorgeous sites and outstanding bike paths. 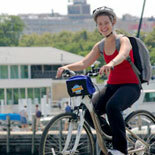 The tours are completed at a relaxing pace, on mostly flat bike paths and trails, with limited street riding. There are lots of stops scheduled to learn about the sites, soak in the atmosphere and take pictures. Each tour begins with a safety and bike usage talk, and the guides are trained in CPR and first aid. Free helmets are provided, as well as top of the line comfort bikes. The Key Biscayne Island Adventure Bike Tour is family friendly with just the right amount of riding, extra time built in to explore the sites on foot and even a snack! Key Biscayne is home to some of the best beaches in South Florida, and the bike trails are a cyclist's paradise! On the way to the island you'll ride over the Rickenbacker Causeway and enjoy stunning oceanfront views! You'll be sure to pass by the Miami Seaquairum and keep a look out for iguanas, squirrels and even dolphin when crossing the bridge. Visit the Fossil Reef Overlook in Crandon Park. Continue to Cape Florida State Park and roll down to the tip of Key Biscayne where a national treasure awaits: the Cape Florida Lighthouse. Then a stop at Bayside Marketplace for refreshments. Don't forget your swimsuit and camera! TAKE IT TO THE STREETS AND TAKE IT ALL IN! 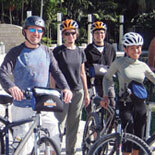 Make your reservations now and get your eTickets for the Key Biscayne Island Adventure Bike Tour. Hop on, there's plenty to do. Experience Incredible sites, fun people and a great ride! Daily @ 2:00pm. Closed: May 19 - 28, Nov 21, Dec 24 & 25. Biscayne Blvd & NE 6th St.
*Experienced Rides only-32 mile ride*. Reservation are required at least 72 hours in advance of desired tour date. Refunds for cancelled tours are available with 48 hours' notice. Cancellations requested with less than 48 hours notice will be not be issued a full credit ~ Remember to bring your camera, sunscreen, water and a snack ~ Tour includes: Use of bicycle, helmet, Professional Tour Guide ~ Exclusions: Gratuities for Tour Guide ~ Please arrive approx 15 minutes before your tour is scheduled to depart so that they can fit your bike and fill out the waiver form ~ Wear seasonally appropriate clothing (not too loose) and closed-toe shoes, and don't forget your camera! ~ Tours may be cancelled for safety concerns such as high winds, thunderstorms, excessive heat or cold, or other severe conditions. In the event of such a cancellation, you may either reschedule or request a full refund.